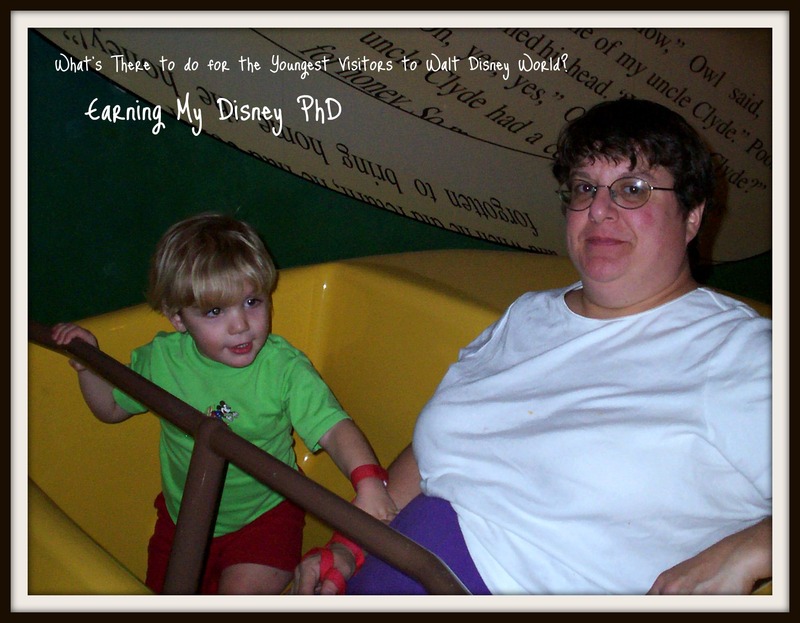 What Is There do do for the Youngest Visitors at Walt Disney World? – What's for Dinner Moms? What Is There do do for the Youngest Visitors at Walt Disney World? This past weekend I was talking to someone about Walt Disney World and what is the “right” age to take children. My kids both started going to Disney World when they were 18 months. Do they remember those trips? No. But, we sure do. They developed great memories for their aunts, uncles and grandparents who have gone with us on each one of the trips. The kids have great memories of grandma riding It’s a Small World with them and having dinner with the Winnie the Pooh characters when they were about 8 years old. So, they may not remember all of their trips but I would not give up a single one of those trips when they were little. We still love to tell the story of how on my daughter’s first trip her favorite things to do were to get ice from the ice machine and standing in the spray at each one of the parks. Or how my son was terrified of the giant hockey masks in All-Star Movies on his first trip and we had to walk around the back of the buildings to get to our rooms because he was scream and refuse to go anywhere he could see them. We are all able to laugh at these stories and they add to the stories now about their favorite things they remember. But, what is there to do for little ones under 5? That depends on the temperament of your child and their size. I have seen little ones tackle Big Thunder Mountain without fear but melt down in The Haunted Mansion. Knowing your child’s tolerance for dark rides and characters can really make or break your trip. Once a new ride scares them and you may have trouble getting them to try anything after that one ride. Over the next few weeks I plan a series of blog posts on different things to do with littlest visitors in each park starting with Magic Kingdom. 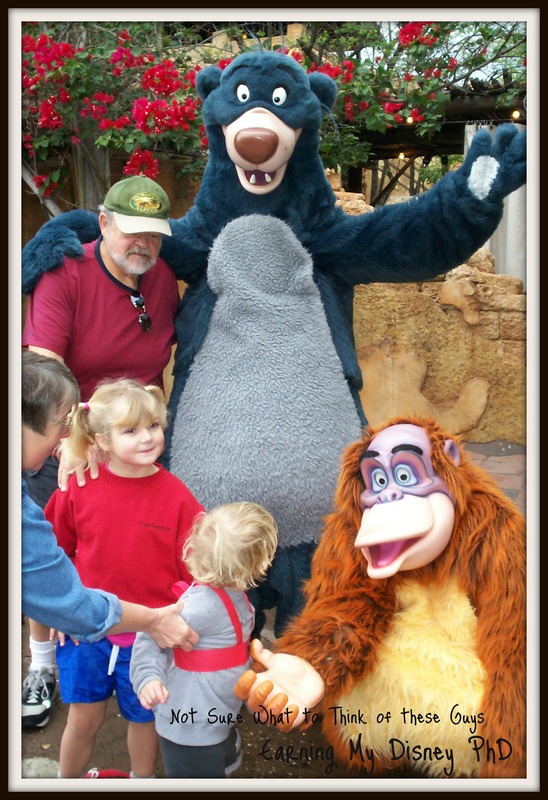 This was my 2 year-old son and 5 year-old daughter with their grandparents meeting Baloo and King Louie. My daughter was fine but my son was not too sure he wanted to have his back to these guys. The more familiar they are with the stories and characters the less likely they will be afraid of certain story elements in the rides and shows. Plus, you will know which rides to avoid if there are any definite fears. My 14 year-old daughter still will not willingly go on the Haunted Mansion ride because it scared her so much when she was younger despite all our reassurances that it was Mickey magic. Buzz Lightyear Space Ranger Spin – you are inside a brightly colored video game. A few dark moments as you start and move between sections. Character Meet and Greets – Most children like the face characters but some are fearful of costumed characters. Mickey, in Celebration Hall, is the only costumed character to talk so that may scare some children. 3 pm parade/Main Street Electrical Parade and Wishes – Wishes is a fireworks show and our autistic son could not handle it until he was older. Splash Mountain – stand outside the ride and look at the drop. There are also smaller drops prior to the big drop in darkness. Big Thunder Mountain Railroad – not overly scary as far as characters or darkness but moves FAST and tends to be a bit jerky in its movement. Peter Pan – The only reason I place this ride here is that the car is suspended from the ceiling and if you have a small squirmy child this ride can be scary for you for fear of having them fall out. This ride does have the pirates and crocodile make an appearance. Many Adventures of Winnie the Pooh – the darker section of the rainstorm and floating feeling of the ride may scare some young children. The Barnstormer – a short first rollercoaster for many children. A few dips and turns but mostly gentle. Seven Dwarfs Mine Train – a fast-moving and rocking side-to-side roller coaster. Brief sections in the dark. Tomorrowland Speedway – this one is here because it is personal to me. I HATED this ride when I had to drive the car. I kept bumping into the rail and people were yelling at me. If your child is not tall enough to ride alone help them steer. So, this is a fairly comprehensive list as of today of the different rides and attractions for the littlest guests at Walt Disney World Magic Kingdom. The biggest piece of advice is know your child’s tolerance for dark or scary things and you will have a great trip by not pushing them into places they are fearful and having them resist any rides or shows for the rest of your vacation. *Transferred from Earning My Disney PhD. Originally published July 29, 2014. This is great to hear. We have a 3 year old and are debating on taking her. I say if you want to take them, take them. They may not remember it but you certainly will.